There's something just a bit naughty in the air at this eccentric and opulent boutique hotel, with its history as an 18th-century pavillon d'amour (inn for trysts) and as the place Oscar Wilde died in 1900 (Room 16 to be exact). Today, the intimate bar and restaurant allows you to mingle with the Parisian beau monde, and an exposed stone grotto holds a countercurrent pool and steam room. Michelin-starred chef Julien Monbabut runs the kitchen of Le Restaurant with an outstanding menu of light and classic French cuisine. Garcia has worked beautifully with the intrinsic quirkiness of the building—rooms encircle a round central staircase that rises six floors (there is also a lift)—to create 20 unique rooms and suites, each designed as a luxurious testament to Wilde's heyday. The Mistinguett room, for example, named after the French cabaret star, is done up in original Art Deco mirrored furniture with prints of the actress; and, of course, the gorgeous ground floor Oscar Wilde suite, with a private terrace, was inspired by his friend Aubrey Beardsley (and is the actual room where he died). The sumptuous top-floor Apartment suite, which can be linked to the adjoining room, has a large terrace overlooking the rooftops of Saint-Germain. All rooms are filled with antiques, luxe fabrics and wallpapers. YOU SHOULD KNOW The quirks of the hotel delight some, annoy others. As Wilde himself might have said, charm is in the eye of the beholder. Charming period bathrooms retain original marble sinks and tubs (some claw foot, some built in, all on the smaller side) with original or reproduction fixtures. Though there are a few freestanding showers, most rooms have handheld showers in tubs. YOU SHOULD KNOW If you are very tall you may want to request a room with a shower. The elegant reception area and sitting room, decorated with original Jean Cocteau drawings and an actual letter written by Oscar Wilde from this address, is a pleasant place to relax. A small, atmospheric basement pool and steam room are available free to guests by reservation. A hot and cold buffet breakfast is served in the beautiful Le Restaurant, which opens onto a cozy private terrace in warm weather. For lunch and dinner Michelin-star chef Julien Montbabut presides, with pastry chef Joana Thöny Montbabut, who also designed the hotel's splendid teatime menu (there is a teatime and tour option). This is one of Paris's most romantic restaurants. YOU SHOULD KNOW The restaurant is not open Sunday or Monday, so plan accordingly. Saint-Germain-des-Prés is Paris's legendary Left Bank epicenter for Parisian literary and intellectual life, where authors and artists (and expats, like Hemingway and Gertrude Stein) once held forth in sophisticated cafés and restaurants. Though many of the landmarks remain, it's now more of a shopping mecca, home to a bunch of the city's most fashionable addresses (including Le Bon Marché department store), not to mention its greatest park, the Luxembourg gardens. But you'll also find plenty of history and remnants of its storied past as well as Paris's oldest church, the Eglise Saint-Germain-des-Prés. Chocoholics take note: Saint-Germain is Paris's chocolate central, with more than a dozen world-class chocolatiers within a square mile. Besides the flagship of pastry guru Pierre Hermé (72 rue Bonaparte), you've got Jean-Charles Rouchoux, Henri Le Roux, Patrick Roger, Jean-Paul Hévin, Maison du Chocolat, Pierre Marcolini, and that's just a start! There's so much within walking distance that you hardly need public transport, but just across the Pont des Arts, a two-minute walk from the hotel, you'll find line no. 1 (Louvre-Rivoli) the city's most central line. 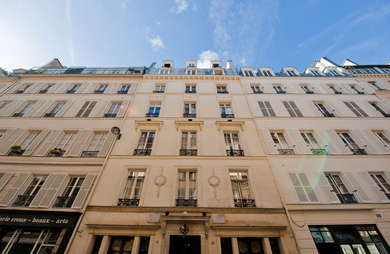 You're also within a few minutes walk of the Saint-Germain-des-Prés station. Three nearby restaurants (with the same respected owners) afford outstanding dining seven days a week: Semilla bistro (54 rue de Seine), Freddy's wine bar next door, and Fish, La Boissonnerie across the street. Le Bar, a small, atmospheric gem (right there in the hotel! ), is the perfect spot for a before-dinner cocktail or champagne. This hotel stands out for character, history and a totally unique presentation. The lavish decor in rooms, bar and restaurant truly stands out among Paris hotels, and its quirks, to our mind, only add to its overall charm. Michelin dining on site is not to be scoffed at!